YWAM Publishing has been a long time favorite of ours. Their Christian Heroes; Then and Now series are spot on historically with the times and Christian values. We chose to review Jim Elliot One Great Purpose for our title. This book geared for ages 10 and up sells for only $6.99 from YWAM. This biography is a beautiful look at a Christian missionary. 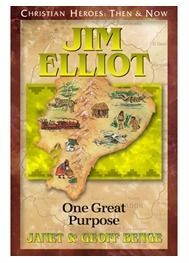 The book begins in 1956 getting us excited about the Auca tribe enroute to visit the missionaries, then Chapter 2 backs us up to 1952 when Jim Elliot first began his journey. Jim Elliot was a missionary along with friend Nate Saint to Ecuador. They worked toward reaching some of the people groups in the jungle to share with them the message of Christ.This is a 'popular' missionary if you will, one that movies have been made of and Mrs. Elliot has written several books. I have always wanted to do a "Missionary of the Month" with the kids, but haven't eve settles in with any curriculum that worked well. This may well be the start of our official program. I loved this book and it worked great with my entire age range of kids. My younger ones 6 and 9 may have not gotten as much out of it, but they definitely understand the great sacrifices that Mr. Elliot made. 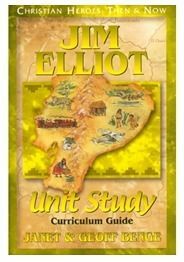 The Jim Elliot One Great Purpose Unit Study Guide for $7.49 brings the biography more to life as you study geography, social studies, history, and missions.The unit study guide really makes the single book, more of a comprehensive study of more than just the book. There are Key Bible Verses for memorization and study. There are chapter questions for discussion to get the kids thinking. There are assignments including creative writing, essay topics, hands-on projects and even dramatic presentation suggestions. We focused a lot on the social studies aspect, of looking at Ecuador and learning the geography of that nation. The study guide is 59 pages long and truly full of great ideas and resources to go along with the book. There are many books in this Christian Heroes Then and Now series and I hope to incorporate them more into our daily homeschool routing. See what the other crew members thought of YWAM by clicking on the banner below.